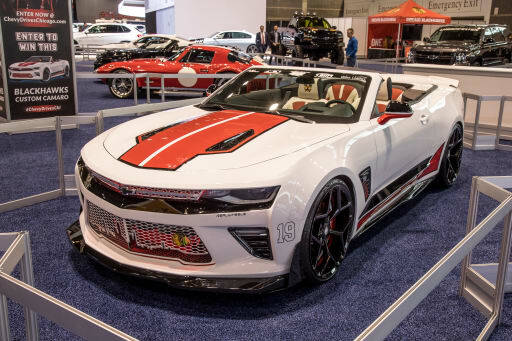 Folks, meet this year's Chicago Blackhawks-themed Chevrolet Camaro at the 2018 Chicago Auto Show. This custom car has been a tradition at the auto show for some time now, and this year's version is just as wild as previous ones. The car started life as a plain — but not boring — Camaro SS convertible. Customizers have added custom pieces designed to let the world know that this car belongs to a fan of the NHL's Chicago Blackhawks. On the outside, the lower grille features an outline of the Chicago skyline and a full-color Blackhawks logo just above a carbon fiber lip spoiler. Flanking the grille on the front quarter panels are the numbers of stars Jonathan Toews (No. 19) and Patrick Kane (No. 88). The wheels have Blackhawks logos in the center. Along the sides are more carbon fiber pieces below red-and-black stripes over the car's white paint. At the rear, the trunk lid spoiler reads "Chicago Blackhawks" and there's another full-color Blackhawks logo next to the right rear taillight. Inside, the interior is red, white and black leather in a custom pattern with Blackhawks logos stitched into the head restraints. There are additional Blackhawks details throughout the interior: Most notable are the logo-shaped gear selector and the plaque at the bottom of the steering wheel. Check out the gallery of this year's Chicago Blackhawks Camaro above, and enter for a chance to win the car here. We also have a gallery of some past Blackhawks Camaros below.